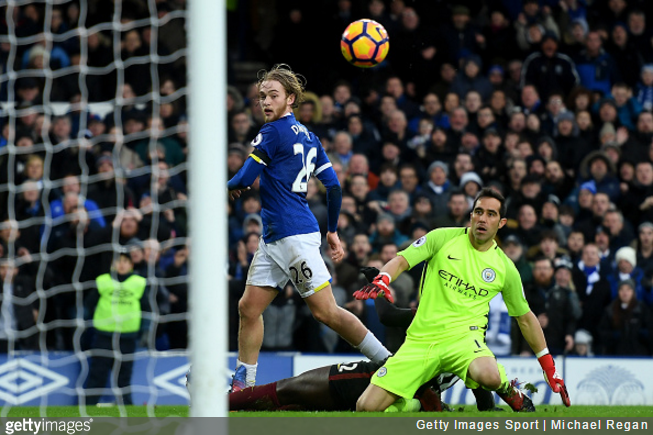 Let’s Hear It For… Tom Davies, Everton’s Latest Boy Wonder! Every once in a while, a performance comes along that suspends – if only temporarily – the deep-rooted cynicism with which you view top-tier professional football. On Saturday, Everton bounced to a proficient 4-0 win over Pep Guardiola’s dull Man City despite amassing only 29% of the possession and mustering four shots on target. The Toffees’ exploits were almost personified by an 18-year-old academy graduate who only made his first senior start for the club a couple of weeks ago. We are of course referring to Tom Davies, who scored, assisted, generally ran himself ragged and took the ‘Man of the Match’ honours as City were torn asunder. There was a little bit of everything in Davies’ performance, including but not limited to a goal-line clearance, a smattering of lovely passes through the lines, guts, determination, composure under pressure and a fair bit of spirited tackling and midfield dirty work. That’s not to mention the cracking little chop through a narrowing gap in the build up to his goal and that beautifully dinky finish over Claudio Bravo. He played with cockle-warming zeal – a giddy cocktail of youthful exuberance and nervous energy – and, while he was by no means flawless, Davies made City’s team of obsessively-drilled drones look positively dowdy in comparison. Good on him. Here’s to an effervescent future. That said, he really does need to find himself a decent pair of shinpads. And he could use a barber to eliminate the need for pulling the tresses away from his face. Academy product? Didn’t they pay Charlton £7mil for him?? Nope, you’re thinking of Lookman. Davies is an academy product i believe. Love it! I absolutely bloody love it when some precocious young talent makes a mockery of the footballing monetary system. he’s english. he’s not going to become anything. Credit Lukaku for not stealing the goal. that chop through the gap was sublime. clichy and toure looked pathetic defending that whole play.